20 MMS December 2016 mmsonline.com THE Z AXIS Commentary What are the lessons of the 2016 election? I am sure we've only begun to learn them, but I see two that will ring true at least to manufacturers. One relates to systems. We got a clue to this lesson during the presidential primaries. In the news reporting of the primary contests on both sides, many noticed for the first time the concept of "superdelegates." One par ty has them and the other does not. What that clue indicates is that the parties are free to choose the systems by which they select their candidates, and those systems could be different. As the clue shows, they are already different from one another. This year, those systems both failed. Both major parties offered up candidates that were widely unpopular from the outset. Neither reflected the hopes or values of anywhere near even half of the voters. America was going to feel unsettled on November 9 no matter what. But again, those systems could be different. May be with dif fe re nt cr ite r ia for f inding a nd elevating contenders. Maybe with a dif ferent means of selecting from among a large candidate pool. As it was, the American people faced the choice these systems gave them, and they chose. 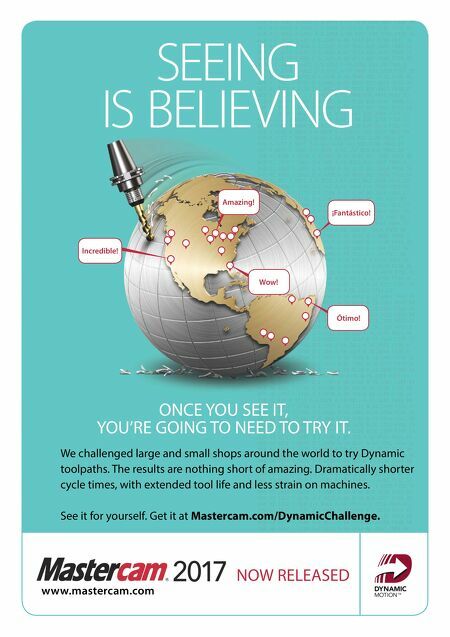 Manufacturers will recognize the problem: A sub-par system impedes output as people slog as best they can within it. But now look at that slog. One striking aspect of this election was the span of agreement among opinion inf lu e nc e r s. Polls la rg e l y agre e d on which choice would prevail. Commentators from d i f f e r e n t c a m p s a g r e e d o n w h i c h c h o i c e ought to prevail. One couldn't be faulted for assuming the matter was done. Yet against all this, people showed up. They stood on their actual opinion, which as far as they knew was unpopular and narrowly held. And in so doing, they changed a great deal. They changed the course we are on. I am not wise enough to see what happens next. And I think I have no delusions about the election's winner. But I am hopeful. With this great change, we have been given a different set of chances. I write about manufacturing. So let it be my small contribution here to offer up the lessons manufacturers can see. The first, as I said, relates to s y s te m s . S y s te m s s h a p e o u tc o m e s . I n a production process, in a political process, we should not fault the people if the design of the system impedes them. Question and correct the system's failings instead. But the second lesson relates to people. People are amazing. They push ahead, and in their push, can achieve something in spite of the impedi- ments. Few manufacturers have production processes as arbitrarily designed as our election process, so manufacturers are that much further ahead. Taking the sweep of this election, then, and reducing it briefly into the themes we recog- nize from our shops, we find this much: (1) It is valuable to develop systems that enable people to realize the best they can deliver, and (2) as valuable as that is, the people involved are even more valuable still. People—people who care—will ultimately find some way to surpass or transcend the system. 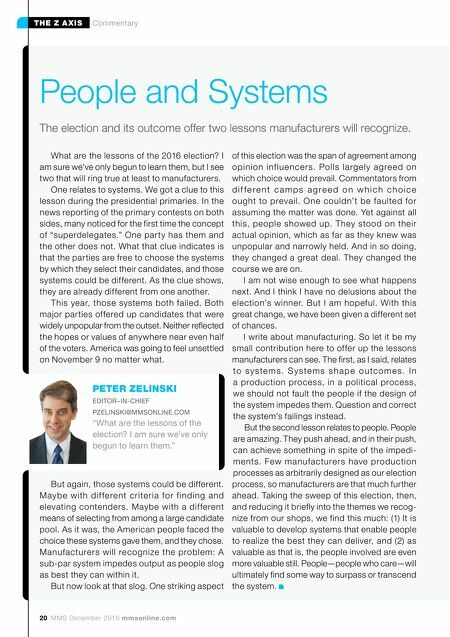 People and Systems The election and its outcome offer two lessons manufacturers will recognize. PETER ZELINSKI EDITOR–IN-CHIEF PZELINSKI@MMSONLINE.COM "What are the lessons of the election? I am sure we've only begun to learn them."